Indian’s Chieftain lineup has been the top-shelf bagger offering from the American V-twin manufacturer. For 2019, the Chieftain, Chieftain Dark Horse, and Chieftain Limited looks got a bit of a spit-shine, along with a few technological updates. 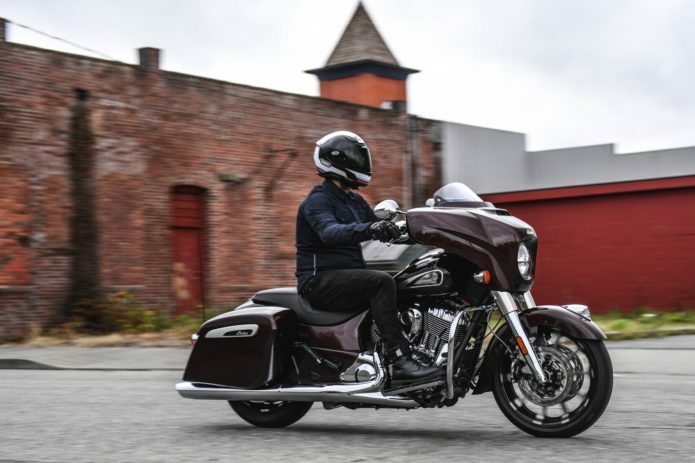 The 2019 Indian Chieftain Limited is not a completely redesigned model, with all critical componentry remaining the same as last year’s offering. However, many of the tweaks have made an already robust platform even more desirable, and an abundance of chrome is what sets the Limited apart from other Chieftains. With the picturesque Cascades in Washington state as our backdrop, we got to know the 2019 Chieftain Limited quite well. 1. Indian’s Thunder Stroke 111 is just what any V-twin fan ordered. Powering the 2019 Limited is Indian’s revered 111ci air-/oil-cooled motor that boasts enough poke to hustle this heavyweight bagger in and out of corners. Indian claims that the 111 boasts an impressive 119 ft/lbs of torque at 3000 rpm, and you’ll be taking full of advantage of the grunt anywhere in the rev range. Perhaps its best attribute is how user-friendly this big twin is, offering up all the thunderous V-twin vibes we want, but without excess. There’s plenty of rumbling to know its working with its smooth refinement standing out immediately. 2. The Thunder Stroke 111 now has rear-cylinder deactivation. It is no secret that large displacement motors have a propensity to shed heat and that was one of the criticisms of Indian’s big twin. To help alleviate those issues when crawling in traffic or idling at stops, the rear-cylinder will deactivate when the engine hits operating temperature, and the outside temperature reaches 60 degrees. 3. The rear-cylinder deactivation transition is hardly perceptible. Without the notification icon on the dash, it was difficult to detect. When it is time to get moving, the cylinder will rejoin the party completely seamlessly the moment you touch the gas. It was hard to effectively access this aspect, as our ride was a bit cold and wet. I can report that I was never uncomfortable when we did have to idle our baggers for extended periods. 4. All Indian Chieftain models now feature three selectable ride modes. A new addition for 2019, the touring models have three selectable ride modes—Tour, Standard, and Sport. The modes can be changed on the fly and all three offer full engine power. “Tour” has the softest throttle mapping, to the point that I would be inclined to label is as a Rain mode, if that were available. “Standard” has good throttle response, on and off, and is fitting of the Chieftain lineup. “Sport” has a nearly direct response and edges towards being abrupt during initial throttle application, and is even more noticeable when closing the throttle. 5. The Chieftain line doesn’t shy away in the corners; it’s ready to tackle them. Big twin baggers aren’t known for their handling prowess, but Indian is trying to change that stigma with their lineup. The room 65.7-inch wheelbase, 25 degrees of rake, 31-degree cornering clearance and 827-pound curb weight are par for the course when it comes to V-twin touring machines. In practice, thought, the motorcycle tells a different story. Whether you’re cruising Main Street or wailing through the canyons, the Chieftain Limited is sure-footed as can be, and inspiring great deal of confidence. 6. A chassis is only as good as its suspension, and the 2019 Chieftain Limited has some nifty suspenders. The 2019 Indian baggers are using the same suspension hardware as before. There’s a non-adjustable 46mm cartridge-damping fork and 4.7 inches of travel, plus a single shock with air-adjust with 4.5 inches of travel. Indian changed the ride height in the back, lowering it a full inch to give the Chieftain bikes that slammed, foreboding look to them. The road feedback is felt, but all of the harshness is left at the door, even when traveling at a good clip over rough asphalt. The chassis and suspension make it comfortable for long rides and keep the motorcycle in shape. 7. Dunlop American Elite and Elite 3 rubber combination can rack up the mileage with ease.Mounted on the Chieftain Limited’s 19-inch/18-inch wheel combo, the Dunlop American Elite and Elite 3 tire combination is adequate in fair-weather conditions. Once the temperature drops or rain droplets start forming, the tires can let go. That is most likely due to the rubber compounds designed to run for ages. Touring bikes will see a wide variety of conditions, and when those conditions arise, I would like to have more faith in my tires. If Indian opted for a softer compound that sacrificed a little mileage, such as the Dunlop Elite 4, that wouldn’t be an unwelcome change. 8. The 2019 Chieftain Limited went under the knife this year. Just like people, motorcycles can use a nip/tuck now and again. To give the Chieftain, Dark Horse, and Limited a more aggressive stance, the fork-mounted fairing was carved up, and the fog-lights were left on the chopping block. New LED turn signals are now mounted to each side of the fairing, instead of being integrated. In the rear, a restyled LED turn signal has been slapped Designers reshaped the saddlebags, giving them a more modern appearance. There were several other changes, though my personal favorite is the new badging on the fuel tank. 9. The Limited and Dark Horse are physically identically and aesthetically at the opposite end of the spectrum. Bolt for bolt – the brooding Dark Horse is identical to the Limited. What defines the Limited is the classic chromed out look that has become a fixture within American V-twin culture. 10. New bags with the same great features—self-latching and remote locking. Have you ever jumped on a bike and absentmindedly forgot to lock the latch on your saddle bag, only to have to flop open when you hit your first big bump, sending your contents flying on the highway? I’m sure I’m not alone. Fortunately, the self-latching mechanism on the Limited work well and prevent that from happening. With the Chieftain’s bags, just flop the lid closed and bam! It’s secure. Also, the remote locking is a welcome feature, as you can lock both bags simultaneously with the touch of a button on the tank. 11. The brakes haven’t been upgraded this year, and we’re not complaining. Up front owners will find dual four-piston calipers gripping on 300mm floating rotors. In the rear, a twin-piston caliper wrangles a 300mm floating rotor into submission. Feel at the lever is a little stout—not something unheard for Touring machines—but has a progressive feel and can be modulated well. The rear brake tells a similar story, with a much softer initial bite. The foot pedal sits at a comfy angle and allows for easy manipulation should you need to correct a line or drag the rear brake when moving slowly. ABS is standard. 12. The Chieftain Limited has all the touring comfort you’ll ever need. Usually, a stiffer saddle means a sore backside; that’s not the case here. This year, Indian redesigned the Chieftain saddle to fit the lineup’s masculine new lines. Hell, they even named the seat the Rogue Gunfighter to drive the point home. 13. Even though its Rogue Gunfighter name suggests otherwise, the low 25.6-inch seat height is incredibly accommodating. I stand at 5’10’’ and found the seating position quite good—lean back and soak in the sights. The handlebars sit at about a neutral height, while the floorboards are gracious with their real estate and don’t drag prematurely. 14. An adjustable windscreen is standard on the Chieftain Limited. Raise or lower the windshield from the right-hand control to fit your needs. In the full upright position, I found the cockpit to be pleasant with reduced helmet bobbing. Of course, that will depend on your height and posture. 15. The 100-watt stereo system got a few updates this year, too. Indian didn’t want to leave their audio system untouched, so they went ahead and separated the tweeters from the mid-range speakers. They were housed together previously, and this reconfiguring claims improved clarity. The significant change is a dynamic equalizer that works to improve sound quality during your ride. As your pace increases, engine and wind noise increase as well, and the equalizer automatically adjusts to improve the sound quality of your music or call. In practice, it works quite well. 16. Navigate your well with faith in your system, thanks to the standard touchscreen infotainment. I have used a fair amount of navigation systems, and it is rare that I am impressed by them. They typically either work well, or they don’t. Between the ease of use and ability to route rides, I exclusively relied upon our navigation system to get around Washington without a hiccup. Riders can punch information in manually, or transfer data from their phones. Just about every bit of bike information can be displayed on a whim, and, of course, you can connect your phone and headset to receive calls or texts and stay in contact with the world. 17. The 2019 Indian Chieftain Limited just got that much better. The Thunder Stroke 111 motor offers up plenty of punch, and with its new brash looks. The elegantly styled Limited retains all of the classic charms that we have come to associate with Indian, while pushing it in a new direction and retaining all the power and handling characteristics we like.